Alarm bells went off in my head, telling me, “Say something! Don’t let this stereotype go unchecked!” I had just spent two years in graduate school practicing having difficult conversations like this one. I wanted to go out into the world to challenge harmful misconceptions that label Syrian refugees as terrorists or Latin American immigrants as a drain on our economy. So here I was, presented with the perfect opportunity to do just that. I wanted to inform him that the Mexican immigrants to which he was referring are likely just trying to find work so that they can provide a better life for their family, not because they are trying to take advantage of our welfare system. 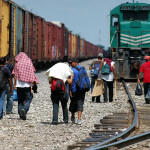 And that the unaccompanied immigrant youth from Latin American countries are crossing the border because they are trying to escape drug and gang violence, not because they think they will get a free ride by crossing the border. Or that the very small percentage of Syrian refugees currently being resettled in the U.S. this year (less than one quarter of one percent of the Syrian refugee population) are not being given unhindered access to our country; for one thing, they have to undergo a thorough vetting process that can take four years before they ever arrive. But when I opened my mouth, nothing came out. The seconds passed, the gentleman kept talking, and I let my chance go by. What if I lived in a country where bombs were being dropped in my neighborhood, where my family was living in fear every moment of the day, or where there were no opportunities to find work so that I could feed my children? I would hope that there would be a place that I could go where people would not judge me based on the country I was coming from, where I was safe from air strikes and gun fights and could find a job to put food on the table. I know that I can’t blame my shameful silence on the shock of hearing those racist and xenophobic statements from the man who bought my car; the problem was that I was afraid of saying the wrong thing, so I said nothing at all. Next time I will be better prepared by using facts and tips from Amnesty International’s I Welcome Campaign. Their resources can support us all in having these dialogues in our daily interactions with friends, family, and strangers we might meet. Equally important is for us to question our own assumptions about other people and reflect on whether the words we say, the actions we take, and the candidates we support, align with our own personal values and how we believe people should be treated. 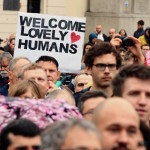 This entry was posted in Refugee and Migrant Rights, USA and tagged IWelcome, Refugee and Migrant Rights, xenophobia by Guest Writer. Bookmark the permalink. The evaluation of these essays become becomes very difficult for admission officers when there are number of students having same profile. Admission essay writing is an art. We gathered number of topics on fighting xenophobia concept. That info you can find from this new acceptor to make perfect stories and essay online reviews. Then you will enjoy a lot with the following services and essay reviews.